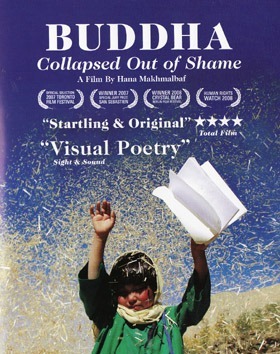 So begins Buddha Collapsed Out of Shame (2007), a film shot in Bamian, Afghanistan, a town blown up by the Taliban in 2001. Critically acclaimed in film festivals around the world, the movie tells the story of a 6-year-old girl, Bakhtay, who desperately wants to go to school. In the 77 minutes of film we witness the obstacles she faces every day in her quest to learn: the need to buy a notebook and a pen, to find the school for girls and escape from a group of young boys playing at enforcing the laws of the Taliban. The film was directed by Hana Makhmalbaf (below), the daughter of Mohsen and Marziyeh and sister of Samira Makhmalbaf, a family of filmmakers from Iran. Hanna was 18 years old when the film was made, developing the story with her mother, the director of Stray Dogs (2004). A full interview and dialogue list are available here. In the everyday images we see on the war in Afghanistan, it is easy to forget the human impact of the war. As IntLawGrrls have chronicled in the "...and counting..." series, news reports focus on the death of soldiers (usually US soldiers), and only occasionally on Afghan civilians. Buddha collapsed out of shame (originally released in Persian as Buda az sharm foru rikht) is a reminder that we could do so much more to help access to education for girls (and boys) around the world. It also calls attention to the effects of decades of war on young children, in areas which are forgotten by the press. An original and thought-provoking movie, worth watching. Write On! "Climate Justice in International Law"